With the continuously emerging new data from high throughput and genomics initiatives, there is a strong need to optimally use the available structural knowledge. This concerns academic research itself as well as bridging academic science and application directed research such as drug design or biotechnology. 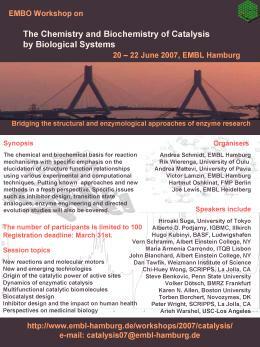 The aim of this workshop is to discuss the continuously developing means for in-depth investigations of biocatalysts. The chemical and biochemical basis for reaction mechanisms will be addressed on a wide range of enzymes. Specific emphasis will be given to the use of structural information from X-ray crystallography and complementary techniques for the elucidation of structure function relationships of biocatalysts. Putting known approaches in a new perspective will also be addressed. 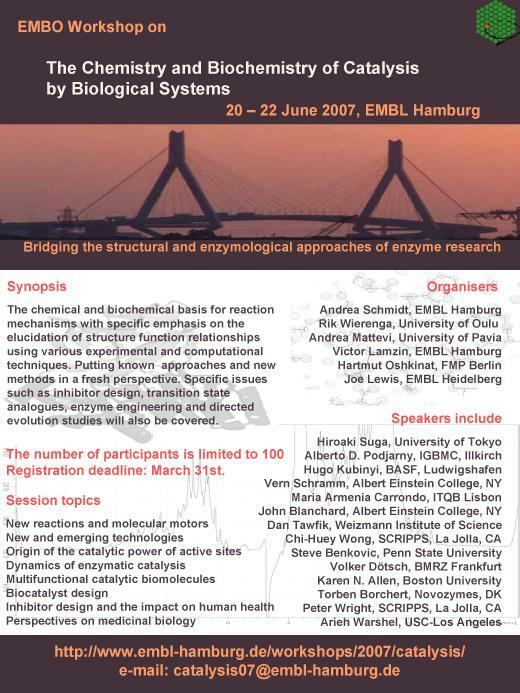 Sufficient time will be allocated to specific problems such as inhibitor design and enzyme engineering using the latest developments in the studies of transition state analogues and on directed evolution approaches. The workshop will gather specialists from a variety of areas in structural and chemical biology as well as a limited number of attendees from young post-doctoral researchers. The topics will cover X-ray crystallography, NMR, biophysical methods such as ITC, spectroscopy and kinetics (enzymology) as well as complementary organic chemistry approaches and computational studies: quantum mechanics, molecular dynamics and in silico docking. Each of these areas will address a specific set of structural properties and the issue of how to best make use of the obtained information. The multidisciplinary program will provide an ideal framework for getting to know the latest developments in this research field.